For other uses, see Kosovo (disambiguation). The Socialist Autonomous Province of Kosovo (Serbo-Croatian: Socijalistička Autonomna Pokrajina Kosovo, Социјалистичка Аутономна Покрајина Косово; Albanian: Krahina Socialiste Autonome e Kosovës; often abbreviated SAP Kosovo), comprising the Kosovo region, was one of the two autonomous provinces of Serbia within Yugoslavia (the other being Vojvodina), between 1946 and the breakup of Yugoslavia. Between 1946 and 1963 the province was named the Autonomous District of Kosovo and Metohija, and enjoyed a lower level of self-government than the Autonomous Province of Vojvodina. Between 1963 and 1974, when the province was granted equal status with Vojvodina, the province was accordingly named the Autonomous Province of Kosovo and Metohija. In 1974 the two autonomous provinces of Vojvodina and Kosovo were granted significantly increased autonomy, and added the prefix "Socialist" to their full official names, the Autonomous Province of Kosovo and Metohija was at that point renamed to the Socialist Autonomous Province of Kosovo, in addition dropping the reference to Metohija from its name. Fifteen years later, during the breakup of Yugoslavia, the 1974 reforms were reversed and the province was restored to its 1963–74 name (Autonomous Province of Kosovo and Metohija). During the interwar period, the constitutional status of Kosovo within Yugoslavia was unclear. At the time that Serbia liberated Kosovo (in 1912-1913), the 1903 constitution was still in force. This constitution required a Grand National Assembly before Serbia's borders could be expanded to include Kosovo; but no such Grand National Assembly was ever held. Constitutionally, Kosovo should not have become part of the Kingdom of Serbia. It was initially ruled by decree. Serbian political parties, and the army, could not agree on how to govern the newly conquered territories; eventually this was solved by a royal decree. In 1944, Tito had written that it "will obtain a broader autonomy, and the question of which federal unit they are joined to will depend on the people themselves, through their representatives" although in practice decisionmaking was centralised and undemocratic. There were various proposals to join Kosovo to other areas (even to Albania) but in 1945 it was decided to join Kosovo to Serbia. 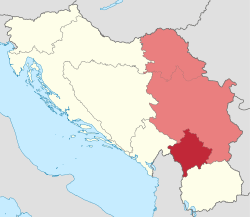 However, one piece of the former Kosovo Vilayet was given to the new Yugoslav republic of Macedonia (including the former capital Skopje), whilst another part had passed to Montenegro (mainly Pljevlja, Bijelo Polje and Rožaje), also a new entity. In July 1945, a "Resolution for the annexation of Kosovo-Metohija to federal Serbia" was passed by Kosovo's "Regional People's Council". In principle, Albanian became an official language; but little changed in practice as most judges and government officials were Slavs. In the immediate post-war years there was a certain amount of cooperation with the Albanian government, which even sent a few Albanian-speaking teachers to Kosovo. From 1946 to 1963, it was the Autonomous District of Kosovo and Metohija (Аутономна Косовско-Метохијска Област), which was a lower level of autonomy than Vojvodina. After the break with the Cominform in 1948, Yugoslavia tightened certain policies, including stricter collectivisation. This led to serious reductions in grain production in Kosovo; there were food shortages across Yugoslavia. In parallel with this, the Albanian government began to criticise Yugoslav rule over Kosovo; the Yugoslav government responded with crackdowns on the local population, in search of "traitors" and "fifth columnists", although the earliest underground pro-Tirana group was not founded until the early 1960s. The Autonomous Province of Kosovo and Metohija (Serbo-Croatian: Autonomna Pokrajina Kosovo i Metohija, Аутономна Покрајина Косово и Метохија, Albanian: Territori Autonom i Kosovës dhe Metohisë) was the name used from 1963 to 1974. The 1963 change had equalised the status of Kosovo and Vojvodina. Kosovo officially became an autonomous province in 1963. Tensions between ethnic Albanians and the Yugoslav government were significant, not only due to national tensions but also due to political ideological concerns, especially regarding relations with neighbouring Albania. Harsh repressive measures were imposed on Kosovo Albanians due to suspicions that they there were sympathisers of the Stalinist policies of Albania's Enver Hoxha. In 1956, a show trial in Pristina was held in which multiple Albanian Communists of Kosovo were convicted of being infiltrators from Albania and were given long prison sentences. High-ranking Serbian communist official Aleksandar Ranković sought to secure the position of the Serbs in Kosovo and gave them dominance in Kosovo's nomenklatura. After the ouster of Ranković in 1966, the agenda of pro-decentralisation reformers in Yugoslavia, especially from Slovenia and Croatia succeeded in the late 1960s in attaining substantial decentralisation of powers, creating substantial autonomy in Kosovo and Vojvodina, and recognising a Muslim Yugoslav nationality. As a result of these reforms, there was a massive overhaul of Kosovo's nomenklatura and police, that shifted from being Serb-dominated to ethnic Albanian-dominated through firing Serbs in large scale. Further concessions were made to the ethnic Albanians of Kosovo in response to unrest, including the creation of the University of Pristina as an Albanian language institution. These changes created widespread fear amongst Serbs that they were being made second-class citizens in Yugoslavia by these changes. Socialist Autonomous Province of Kosovo was the name used from 1974 until 1990. The Autonomous Province of Kosovo and Metohija received more autonomy within Serbia and Yugoslavia during the 1970s, and its name was officially changed in 1974 to Socialist Autonomous Province of Kosovo ("and Metohija" was removed because it was not used by the Kosovo Albanians and "Socialist" was added to further show the Socialist ideal of the then SFRY). In the 1974 Constitution of Yugoslavia, Kosovo was granted major autonomy, allowing it to have its own administration, assembly, and judiciary. Per the Constitutions of SFR Yugoslavia and SR Serbia, SAP Kosovo also gained its own Constitution. The Province of Kosovo gained the highest officials, most notably Presidency and Government, and gained a seat in the Federal Presidium of Yugoslavia (including veto power on the federal level) which equated it to the states of SR Serbia. The local Albanian-dominated ruling class had been asking for recognition of Kosovo as a parallel republic to Serbia within the Federation, and after Josip Broz Tito’s death in 1980, the demands were renewed. In March 1981, Albanian students started the 1981 protests in Kosovo, where a social protest turned into violent mass riots with nationalist demands across the province, which the Yugoslav authorities contained with force. Emigration of non-Albanians increased and ethnic tensions between Albanians and non-Albanians greatly increased, with violent inner-attacks, especially aimed at the Yugoslavian officials and representatives of authority. Slobodan Milošević became the leader of the Serbian communists in 1986, and then seized control of Kosovo and Vojvodina. This can especially be seen in the 1987 rift in Kosovo, which became the final turnout of possibilities of peace between Albanians and Yugoslavia. In 1988 and 1989, Serbian authorities engaged in a series of moves known as the anti-bureaucratic revolution, which resulted in the sacking of province leadership in November 1988 and a significant reduction of autonomy of Kosovo in March 1989. On 28 June 1989, Milošević led a mass celebration of the 600th anniversary of a 1389 Battle of Kosovo. Milošević's Gazimestan speech, which marked the beginning of his political prominence, was an important part of the events that contributed to the ongoing crisis in Kosovo. The ensuing Serbian nationalist movement was also a contributing factor to the Yugoslav Wars. The status of Kosovo was returned to the pre-1974 Autonomous Province of Kosovo and Metohija by the Kosovo Parliament on 28 September 1990. The Kosovo War followed. Later, in 2008, Kosovo declared independence. 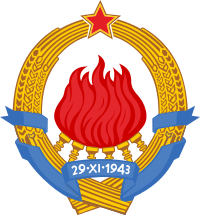 The only political party in the province was League of Communists of Kosovo, which was part of the League of Communists of Serbia and part of the League of Communists of Yugoslavia. ↑ Malcolm, Noel (1999). Kosovo: A Short History. Harper Perennial. ISBN 978-0-06-097775-7. ↑ Olga Popović-Obradović, The Parliamentary System in Serbia 1903-1914. ↑ Malcolm, Noel. Kosovo: A Short History. London: Macmillan. p. 315. ISBN 0-330-41224-8. ↑ Malcolm, Noel. Kosovo: A Short History. London: Macmillan. p. 316. ISBN 0-330-41224-8. ↑ Malcolm, Noel. Kosovo: A Short History. London: Macmillan. p. 322. ISBN 0-330-41224-8. 1 2 3 4 5 6 Independent International Commission on Kosovo. The Kosovo report: conflict, international response, lessons learned. New York, New York, USA: Oxford University Press, 2000. Pp. 35. ↑ Melissa Katherine Bokovoy, Jill A. Irvine, Carol S. Lilly. State-society relations in Yugoslavia, 1945–1992. Scranton, Pennsylvania, USA: Palgrave Macmillan, 1997. Pp. 295. 1 2 3 Melissa Katherine Bokovoy, Jill A. Irvine, Carol S. Lilly. State-society relations in Yugoslavia, 1945–1992. Scranton, Pennsylvania, USA: Palgrave Macmillan, 1997. Pp. 296. ↑ Melissa Katherine Bokovoy, Jill A. Irvine, Carol S. Lilly. State-society relations in Yugoslavia, 1945–1992. Scranton, Pennsylvania, USA: Palgrave Macmillan, 1997. Pp. 301.